A guitar amplifier is an electronic amplifier designed to make the signal of an electric or acoustic guitar louder so that it will produce sound through a loudspeaker. Guitar amplifiers also modify the instrument’s tone by emphasizing or de-emphasizing certain frequencies and adding electronic effects. Amplifiers consist of one or more circuit stages which have unique responsibilities in the modification of the input signal. The power amplifier or output stage produces a high current signal to drive a speaker to produce sound. One or more preamplifier stages precede the power amplifier stage. The preamplifier is a voltage amplifier that amplifies the guitar signal to a level that can drive the power stage. There may be one or more tone stages which affect the character of the guitar signal: before the preamp stage (as in the case of guitar pedals), in between the preamp and power stages (as in the cases of effects loop or many dedicated amplifier tone circuits), in between multiple stacked preamp stages, or in feedback loops from a post-preamp signal to an earlier pre-preamp signal. The tone stages may also have electronic effects such as equalization, compression, distortion, chorus, or reverb. Amplifiers may use vacuum tubes, or solid state (transistor) devices, or both. 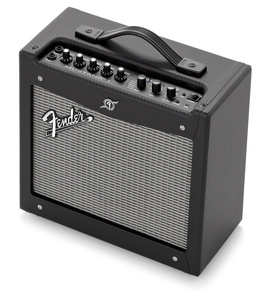 There are two configurations of guitar amplifiers: combination ("combo") amplifiers, which include an amplifier and one, two, or four speakers in a wooden cabinet; and the standalone amplifier (often called a "head" or "amp head"), which does not include a speaker, but rather passes the signal to a speaker cabinet or "cab". 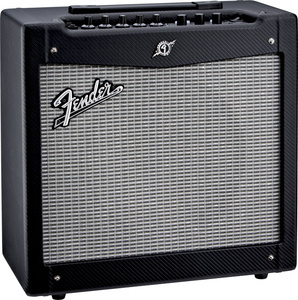 Fender® Frontman® amps deliver quality tone at a great price, with the unmistakable Fender Blackface™ look. 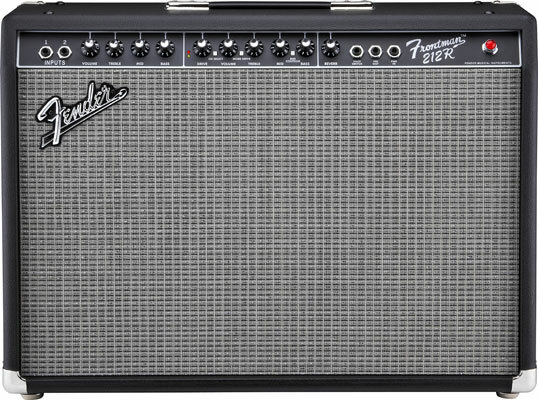 The 100-watt Frontman 212R features two 12” Special Design speakers, classic styling, simple controls, drive and more drive distortion and channel switching, and reverb. One of the best bang-for-the-buck amps around. Mustang I is a 20-watt closed-back combo with an 8” Special Design speaker that sounds great and pumps serious volume. It contains 24 highly accurate on-board amp presets with tones from vintage Fender sparkle to outrageous modern metal distortion, and a bank of 24 built-in effects including chorus, flanging, phasing, tremolo, vibratone, step filter, reverb, echo, octaver and more - 12 modulation effects and 12 delay and reverb effects in all. Mustang II is a 40-watt closed-back combo with a 12” Special Design speaker that sounds great and pumps serious volume. It contains 24 highly accurate on-board amp presets with tones from vintage Fender sparkle to outrageous modern metal distortion, and a bank of 24 built-in effects including chorus, flanging, phasing, tremolo, vibratone, step filter, reverb, echo, octaver and more - 12 modulation effects and 12 delay and reverb effects in all.